You don't have to eat Burgers and French fries all day, but it's almost certain that you got to eat MORE than before. In this installment we will thus take a look on how much you'd minimally to function in your regular everyday life. In view of the fact that each of those steps should contain at least one thing you can actually do, we will start out right with the single most important change you will have to make in order to escape the self-perpetuation vicious circle I've been outlining in the last installment of this series. Step 1: Increase your energy intake! But how much do you need? If you take a look a the way the luteinizing hormone secretion becomes impaired, when your energy intake goes below a critical threshold of roughly 30kcal/kg (for men you will see propably see your T-levels plummet if you go below this level - diet or not! ), it should be obvious that your first step towards recovery is to increase your basal energy intake, i.e. the amount of energy you consume irrespective of your daily energy expenditure, above this critical threshold. For a 25-year old woman with a body fat percentage of 20% and a total body weight of 65kg this would imply that your daily energy intake must never be lower than 0.8 x 65kg x 30kcal/kg = 1560kcal - even when you are dieting. Multiplied with the "correct" Acitivity Level Factors these REE values will also yield an estimation of your overall daily energy expenditure which is 1.53x, 1.76x and 2.25x higher than your REE depending on whether you are sedentary or lightly active (1.53x), active or moderately active (1.76x) or vigorously active (2.25x), with the latter being the category approx. 90% of those who are trapped in the athlete triad still belong to. It is easy to see that this equation has been developed to be used in professional studies. After all, the majority of people won't even know that there is a profound difference between both your fat mass and your total adipose tissue mass, as well as your "lean mass" and the amount of skeletal muscle tissue you are effectively carrying around. the same cannot be said of the more sophisticated equation Oshima et al. proposed. Not because it was more complicated to plug the figures into a calculator, but rather because you are unlikely to have the respective data handy. Since this is at least in my experience the parameter most of you will be missing, I base the following example calculation on the assumption that we don't have the quantitative data on Mrs Jane Average's bone mineral density and are thus not able to estimate the corresponding bone mass (in kg) by multiplying the bone mineral density (in g) by x 1.85 / 1000.
meats, eggs, fish, dairy, etc. rice, (sweet) potatoes, oats, pasta, bread, etc. coconut oil, olive oil, butter, ghee, sauces, etc. So, assuming that I did not hit the wrong buttons on my calculator, this result is actually almost identical (8.74kcal/day) to the estimation the Harris-Benedict equation yielded. This in turn, goes to show you that within the "normal zone", into which Mrs. Jane Average certainly would fall, simple standard equations such as the often criticized, yet still widely used Harris-Benedict equation appear to be pretty accurate. At least, when we are talking about the minimal requirements of someone who's not doing much more than walk from the bed, to the fridge, to the car, to the table in his office, back to the car and ... you know what the average white-color worker does these days. Extraordinary individuals have extraordinary energy requirements - and you are extraordinary! Fortunately, you are none of those office "triseathletes" whose athletic triad consists of exhaustive in your office chair idling, extreme stressed in the car sitting and lazy on the couch lying... right? I thought so! And this is why there is no way that the ~1,500kcal will suffice to break out of the vicious circle of a real athlete's triad. On the contrary, it is however "as sure as eggs is eggs" that falling short of those minimal energy requirements is the single best recipe to fall victim to the very same triad. 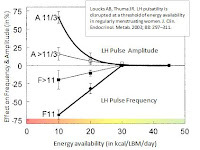 If you take another look at figure 1, the corresponding LH-based energy intake rule of thumb, I derived from the data by Loucks et al., as well as the coefficients (the factors in front of the parameters) in the Oshima equation, it should actually be obvious that those basal energy requirements are more or less "hard-wired" into our hypothalamic energy control system. 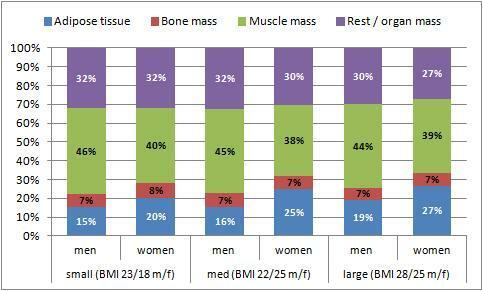 With 54 out of 74kcal/kg body weight (73%) being used simply for the maintenance of organ functions, alone (! ), there is not much room to conserve energy other than eating up the organs, the bones and the skeletal muscle and of course shutting down such superfluous organs as the ovaries or testes, and... hold on, aren't that all the symptoms of the athlete's triad? Against that background it is no wonder that my statistical makeover of the stats from a list of studies that was included in a 2002 paper by Manore, already suggests that the 1,500kcal are in fact an absolute minimum for the real light-weights among female athletes. 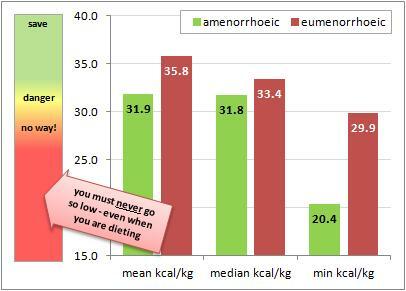 Only in one of the 15 studies with datasets from 138 women on which the values in figure 3 are based, were the ~30kcal/kg body weight sufficient to prevent onset of amenorrhea. And when I am telling you that this group of female athletes also happened to be the group who consumed the highest amount of carbohydrates relative to their overall calorie intake per kg of body weight, I am actually already touching on the topic of the next installment, in which we are going to take a look on how you should distribute your overall energy intake across the macronutrient spectrum. A pros pos, while you are waiting for the next installment of this series you should stop counting asparagus spears, calculate your resting metabolic rate and see where you are standing, in terms of your current caloric intake! And though I personally doubt both the quantitative validity of the activity level factors Harris and Benedict provide, you should not forget that chances are slim if not non-existent, that you will recover, if you don't aim for a 1.76x higher energy intake than your RMR calculations would prescribe on workout days. Harris JA, Benedict FG. A biometric study of basal metabolism in man. Publ no 279. Washington, DC: Carnegie Institution, 1919. 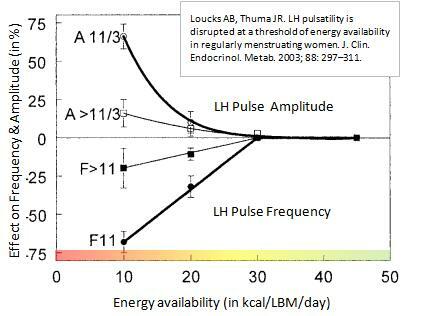 Loucks AB, Thuma JR. LH pulsatility is disrupted at a threshold of energy availability in regularly menstruating women. J. Clin. Endocrinol. Metab. 2003; 88: 297–311. 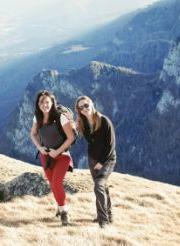 Manore MM. Dietary recommendations and athletic menstrual dysfunction. Sports Med. 2002;32(14):887-901. Oshima S, Miyauchi S, Kawano H, Ishijima T, Asaka M, Taguchi M, Torii S, Higuchi M. Fat-free mass can be utilized to assess resting energy expenditure for male athletes of different body size. J Nutr Sci Vitaminol (Tokyo). 2011;57(6):394-400. Taguchi M, Ishikawa-Takata K, Tatsuta W, Katsuragi C, Usui C, Sakamoto S, Higuchi M. Resting energy expenditure can be assessed by fat-free mass in female athletes regardless of body size. J Nutr Sci Vitaminol (Tokyo). 2011;57(1):22-9.